Shares of the country’s largest telecom player in terms of subscribers, Vodafone Idea (VIL), tumbled after its board approved a Rs 25,000-crore rights issue, one of the largest in Indian markets. The stock recovered after falling as much as 7.6 per cent to Rs 29.6 a piece (close to a 52-week low of Rs 28.8), ending at Rs 33 a piece, up 3 per cent from the previous close. VIL shareholders would be able to buy 87 shares for every 38 held for an issue price of Rs 12.50 a share, or a 60 per cent discount to the current stock price. However, in terms of the adjusted share price for the rights issue, which is Rs 18.7, the discount is 33 per cent. In comparison, competitor Bharti Airtel’s rights issue is at a 26 per cent discount. Amit Tandon, managing director at proxy advisory firm Institutional Investor Advisory Services, said rights issues are a way to reward existing shareholders and as such VIL shareholders have been losing money in the stock for long. “Rights issues have historically been on deep discounts to the current market price. Keeping the price close to the current stock price is a relatively new trend. Pricing it at Rs 12.50 may showcase lack of confidence in one’s business, but another way of looking at it is that it ensures existing shareholders participate and make some returns on their investments,” he said. “It is not a deeper discount than other rights issues in the past, and hence it is not a sign of weakness. It is the largest investment announced in a rights issue by promoters. It reflects a deep belief in what the company is doing rather than a sign of weakness,” said a source close to the development. 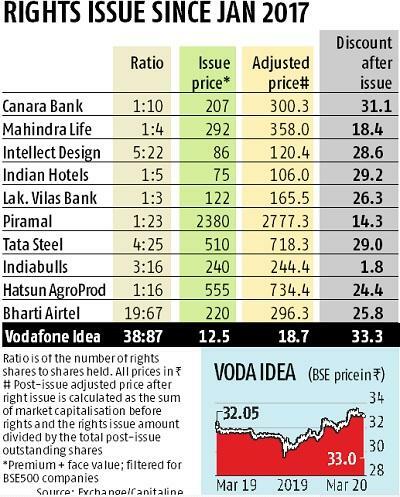 In BSE 500 companies since January 2017, VIL rights issue is at the highest discount of 33 per cent. Rajan Mathews, director general of Cellular Operators Association of India (Coai), noted that it was a strong statement from the promoters to the market to show that they were bullish about the sector and its growth. “The pricing premium depends strongly on the market sentiments which are poor at present. It’s heartening to see that incumbents like Vodafone Idea and Bharti Airtel are being bullish with rights issues signalling that they won’t back down to competition,” said Mathews. In a fiercely price competitive market, Vodafone Idea’s fund-raising is the second attempt by a telco to pare its Rs 1.1-trillion debt and fund capex plans. Besides the rights issue, it aims to raise about Rs 5,000 crore from the sale of its 11.5 per cent stake in Indus Towers and monetise fibre assets to the tune of Rs 15,000 crore. After the issue and the sale, it will have Rs 45,000 crore of available cash. Analysts said the hefty discount was an attempt to ensure that the rights issue was at least fully subscribed, if not oversubscribed, given the market’s apprehensions over the telecom sector. As part of the fund-raising plan, promoters of the company Vodafone UK and Aditya Birla Group intend to contribute up to Rs 11,000 crore and Rs 7,250 crore, respectively, as part of the rights issue. The company has plans to build more capacity and 4G coverage by reusing the existing capital. 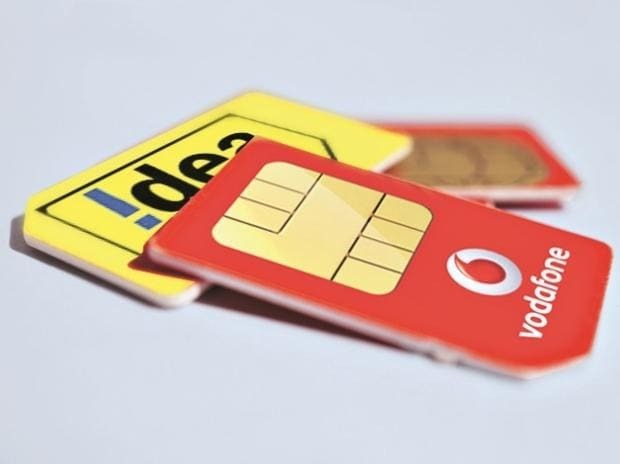 While tariff increase is one possibility for growth, Vodafone Idea believes that the funds raised will give it the opportunity to bring in more subscribers under 4G coverage and data. Rating agency India Ratings has downgraded Vodafone Idea’s long-term issuer rating to ‘IND A+’ from ‘IND AA-’ and placed it on rating watch negative. Its capex (Rs 1,170 crore for the December quarter) continues to worry sector analysts as its rival telcos reported higher capex numbers. Bharti Airtel India reported a capex of Rs 5,309 crore, while Jio reported Rs 14,000 crore in Q3 of 2018-19.